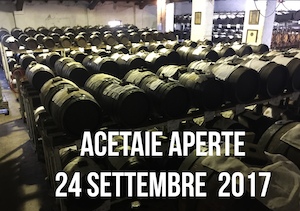 “Acetaie aperte” is the event of degustation of the original balsamic vinegar of Modena that will take place on the 24th of September organized by the Consortium of Balsamic Vinegar of Modena and the Traditional Balsamic Vinegar Consortium of Modena PDO to inform the public how this precious food comes from secular history. There are 37 adherents in the Province of Modena who offer guided tours of the farm, with the opportunity to attend the various stages of production and tastings of the precious food in combination with other products of excellence in the territory, all inserted in the context of personalized initiatives organized from single Acetaies. In particular, it is worth mentioning the opportunity to entertain for aperitifs and snacks or lunches with “balsamic” menus or the chance to attend showcooking in vinegar. Both the Balsamic Vinegar of Modena IGP and the Traditional Balsamic Vinegar of Modena DOP, the two denominations involved in the day, represent a national point of reference among all the Geographical Indications, with hundreds of producers, from small family businesses to large companies. They also represent a strategic sector for the development of the whole territory, not only from an economic point of view, but also social and cultural for those who live in this land. That is why it becomes an opportunity not to miss: this appointment now consolidated in the calendar of Italian food and wine events in early autumn with the black gold of Modena, in fact represents an interesting confirmation of the growing trend of Italian and foreign tourists to choose as a destination for those areas where the food and wine component is strongly present, along with an emotional component coming from the producers’ loudspeakers. If you want to enter in contact with the production of this amazing product, come to Acetaie aperte!